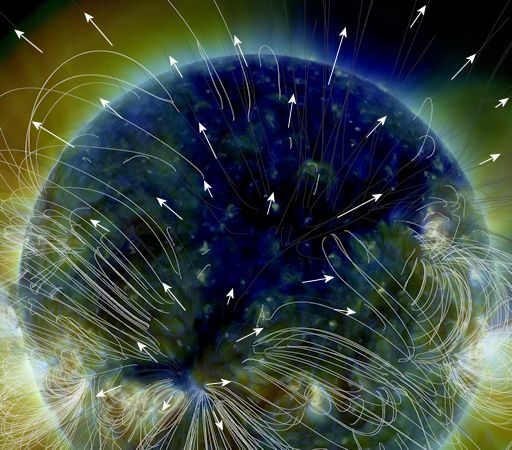 A gigantic hole in the sun’s atmosphere has opened up and a broad stream of solar wind is flowing out of it. Coronal holes are places in the sun’s atmosphere where the magnetic field unfurls and allows solar wind to escape. In the image above, the sun’s magnetic field is traced by white curving lines. Outside the coronal hole, those magnetic fields curve back on themselves, trapping solar wind inside their loops. Inside the coronal hole, no such trapping occurs. Solar wind plasma is free to fly away as indicated by the white arrows. For much of the next week, Earth’s environment in space will be dominated by winds flowing from this broad hole. This should activate some beautiful Arctic auroras. NOAA forecasters estimate a 65% of polar geomagnetic storms today as Earth moves deeper into the solar wind stream.